Laguna True Corner Bath - Only £219.99! In stock now for just £219.99 including VAT! Hurry while stocks last! Luxury, comfort, space and relaxation combine in the stunning Laguna corner bath by Synergy. One of the most popular corner baths available anywhere today, this sublime bath is designed specifically to maximise bathing space and to offer the most relaxing soak possible. A perfect option for any bathroom, this is an ideal choice for couples, families, or anyone looking for a lovely place to unwind. The stylishly designed Laguna corner bath creates an excellence of ambience to the bathroom due to its modern design. The Laguna corner bath mixes intelligent space-saving design with unbeatable comfort. This superb corner bath is intelligently designed to offer a very large bathing area in a comparatively small space. This makes this great value, high-quality bath the ideal place to relax and unwind, providing you extra room to spread out and drift away. Thanks to its increased bathing area, you can fill this bath extra deep for that perfect late night soak. 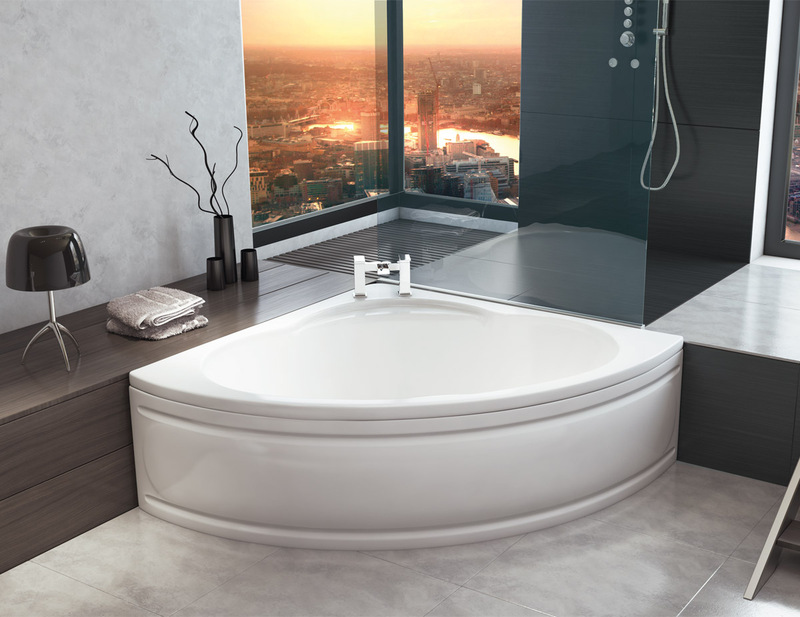 Manufactured in high quality white gloss acrylic, this deluxe bath offers maximum strength, sturdyness and reliability. The quality of the finish is such that the surface is ultra smooth, offering a sublime bathing experience and a level of comfort superior to many other baths. It is also easier to clean and more stain resistant. This bath comes with an inbuilt seat for maximum comfort, and is supplied with legs set pack and fittings. The front panel pictured above is available as an optional extra, selectable via the drop-down menu below. The superbly luxurious Laguna corner bath comes complete with adjustable feet kit and optional front panel, to offer additional advantage. It is made from 5mm thick high-quality acrylic, to make it tremendously durable and strong. 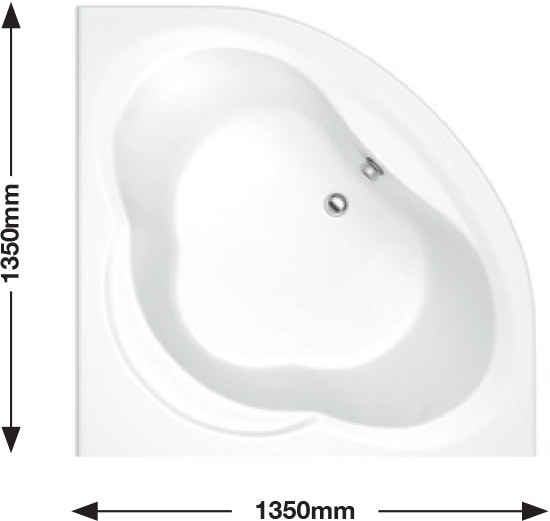 Optional Curved Front Panel is available for this bath as an additional extra. (Please see the drop-down menu below). This bath is available in one size (1350 x 1350mm) only.